It’s mid-morning at the Madinat Jumeirah, a luxury resort in Dubai. Dozens of well-dressed women sit on white couches, waiting. They include artists, gallerists, auction-house directors and local collectors, most of them princesses or wives of the well-off. They’ve been waiting an hour. Suddenly, 20 or so women, dressed in traditional Islamic abayas, enter the room and move through the crowd like black smoke. Her Highness Sheikha Manal, daughter of Dubai’s ruler, has arrived. This is Ladies Day at Art Dubai, the biggest contemporary art fair in the Middle East. Sheikha Manal has come to attend talks by Judith Greer, an American collector, and Venetia Porter, a curator of Islamic art for the British Museum. The fair itself hasn’t yet opened, but a select group of women is always given a chance to preview and learn about the art on their own, without men. In a culture notoriously dismissive of women, one could easily assume Ladies Day to be a sideshow. But that would be wrong. Connoisseurs from the west generally consider the art market in the Gulf underdeveloped. Compared to other emerging markets, such as India and China, there are few collectors, and museums, galleries and exhibitions are thin on the ground. But a cadre of women, both at the royal and grassroots levels, is leading the effort to bring the Arab art market into the mainstream. Sheikha Manal and her sister, Sheikha Latifa, also at Ladies Day, are among a handful of royal women at the vanguard of this push. Working independently, the two have established artist studios, an exchange programme with foreign art fairs, and awards for young Emirati artists. Nearby in Abu Dhabi, the oil-soaked capital of the Emirates where both the Guggenheim and the Louvre are building affiliate museums, Sheikha Salama and her daughter, Sheikha Mariam, have created a series of seminars and activities to teach locals about art and culture. Sharjah, home of the region’s largest art exhibition (the Sharjah Biennial, which, incidentally, is directed by another princess, Sheikha Hoor) boasts similar projects, such as an arts management training programme for local Emiratis. In the four years this programme has been running, half of the 520 staff members are women, as well as 12 of the 14 curators. The UAE is not, however, the foregone capital of art in the Middle East, or even of the Gulf states. It is also not the only country in the region where women are taking leading roles in the art world. Qatar’s Sheikha Al Mayassa, the daughter of the Emir, runs the Qatar Museums Authority. Her latest project is launching Qatar’s Museum of Modern Arab Art, a collection of more than 6,000 pieces. Kuwait’s Sheikha Lulu Al Sabah in February held her country’s first-ever contemporary art auction. “Especially in the Middle East, having a title can be very helpful,” says Libya’s Princess Alia al-Senussi, who sits on the board of Art Dubai, in a bit of an understatement. Still, royals cannot grow an art market without some help. Expat women in the region, mostly 20- and 30-somethings living in Dubai, are seizing on the opportunity to start galleries, auctions and exhibition spaces, the bread and butter of a commercial market. The two big contemporary art galleries in Dubai, The Third Line and Isabelle van den Eynde, both of which are run by women, have seen values soar for their Arab and Iranian pieces. At Art Dubai this year, both sold work to Don Rubell, an important American collector, a sign of growing interest in the region among global trend-makers. Some galleries tailor themselves to the community. 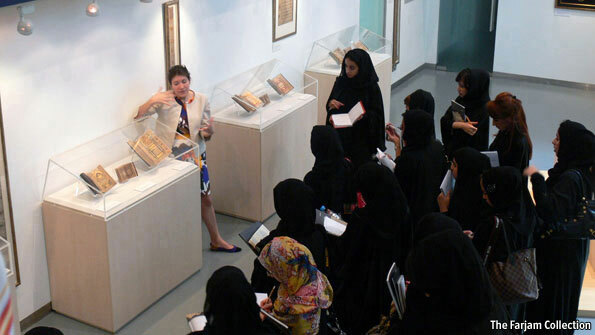 At the Farjam Collection, a non-profit gallery owned by Farhad Farjam, an Iranian collector, Emilie Faure, a young French woman who manages the space, gives lectures to female Zayed University students at 7:30am two Thursdays a month. These students prefer not to be seen during regular exhibition hours, when males are in attendance. Sensing a market opportunity, Christie’s held its first auction in Dubai in 2006, and nearly doubled its sales expectations. The auction house now works with a range of regional collectors in the Emirate, where there are signs that the market is broadening. According to Isabelle de la Bruyere, the director of Christie’s Middle East operations, about half the attendees at last year’s sale were new customers. In part this success can be attributed to the firm’s efforts to educate Emiratis on how auctions work, with lectures and educational seminars sometimes tailored to wealthy wives. Sotheby’s, on the other hand, tried its luck with an auction in Doha last year, but found the market too thin. Auctions need competitive collectors, and no one wanted to bid against the royal family in Qatar. What does all of this mean for the Arab art market? Women are very active in the industry in the West, but the Gulf’s entrenched religious and cultural mores make gender a tricky subject. Some cynics say female leadership is great for the art market, largely because these women have to involve their husbands if they want to buy anything. Others worry that the region’s appetite for contemporary art is simply too vulnerable, regardless of who’s in charge. At Art Dubai this year, for example, some edgy paintings were pulled from the wall before Sheikh Mohammed, Sheikha Manal’s father, passed through. An oil shock or political turmoil could easily bring a cultural clampdown. But for now the efforts appear to be working: attendance at the fair this year was up 28%, and the galleries reported strong sales. Not a revolution, by any means, but veiled steps forward for the Arab art market.